More than 1.2 million people in metropolitan New Orleans have been warned to evacuate out of the possible path of Ivan, which is expected to arrive in the U.S. as early as Wednesday. The 140-mph hurricane is churning toward the Gulf Coast and, possibly, New Orleans - a below sea-level city which would be partially submerged if it were to suffer a direct hit. Residents streamed inland in bumper-to-bumper traffic in an agonizingly slow exodus amid dire warnings that Ivan could overwhelm New Orleans with up to 20 feet of filthy, chemical-polluted water. About three-quarters of a million more people along the coast in Florida, Mississippi and Alabama were also told to evacuate. Ivan, which is about 260 miles south-southeast of the mouth of the Mississippi River, is moving north-northwest at about 12 miles per hour. Ivan is now a Category 4 hurricane and is expected to make landfall as a major hurricane - at least as powerful as Category 3. Ivan, which killed at least 68 people in the Caribbean, is enormous - with hurricane force winds extending 105 miles from the center and tropical storm force winds extending outward by as much as 260 miles. The National Hurricane Center says water levels are already running about a foot above normal along the north Gulf coast. "A total disaster. I mean catastrophe. Tens of thousand probably perishing," said hurricane researcher Ivor Van Heerden. "Hopefully the house will still be here when we get back," said Tara Chandra, a doctor at Tulane University in New Orleans who packed up his car, moved plants indoors and tried to book a Houston hotel room. Chandra said he wanted to ride out the storm, but his wife wanted to evacuate: "All the news reports are kind of freaking her out." 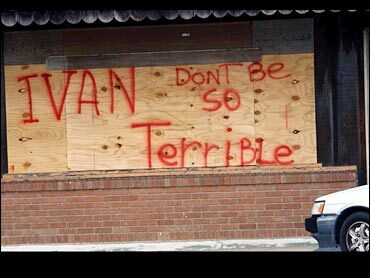 Ivan could cause significant damage no matter where it strikes. Officials ordered or strongly urged an estimated 1.9 million people in four states to flee to higher ground. "I beg people on the coast: Do not ride this storm out," Mississippi Gov. Haley Barbour said, urging people in other parts of the state to open their homes to relatives, friends and co-workers. The National Hurricane Center in Miami posted a hurricane warning for about a 300-mile swath from Apalachicola in the Florida Panhandle to New Orleans and Grand Isle in Louisiana. Forecasters said Ivan could bring a coastal storm surge of 10 to 16 feet, topped by large, battering waves. "If we get the kind of tidal surge they are saying, the fishing boats are all going to be in the trees," said Jamee Lowry, owner of a bar and restaurant in Perdido Key, Fla., near the Alabama border. could be destroyed. After Hurricane Frederick destroyed the Mississippi and Florida Panhandle beaches in 1979, condos and beachfront homes were rebuilt even closer to the shoreline. New Orleans, the nation's largest city below sea level, is particularly vulnerable to flooding, and Mayor Ray Nagin was among the first to urge residents to get out while they can. The city's Louis Armstrong Airport was ordered closed Tuesday night. Up to 10 feet below sea level in spots, New Orleans is a bowl-shaped depression that sits between the half-mile-wide Mississippi River and Rhode Island-size Lake Pontchartrain. It relies on a system of levees, canals and huge pumps to keep dry. The city has not taken a major direct hit from a hurricane since Betsy in 1965, when an 8- to 10-foot storm surge submerged parts of the city in seven feet of water. Betsy, a Category 3 storm, was blamed for 74 deaths in Louisiana, Mississippi and Florida. Experts said Ivan could be worse, sending water pouring over levees, flooding to the rooftops and turning streets into a toxic brew of raw sewage, gas and chemicals from nearby refineries. Nagin said he would "aggressively recommend" people evacuate, but that it would be difficult to order them to, because at least 100,000 in the city rely on public transportation and would have no way to leave. In addition, he said 10,000 people were in town for conventions, and there was nowhere for many of them to go except their hotels. Tuesday, traffic on Interstate 10, the major hurricane route out of New Orleans, was at a near standstill, and state police turned the interstate west of the city into a one-way route out. U.S. Highway 59 to Baton Rouge also was jammed. In the French Quarter, businesses put up plywood and closed their shutters. A few people were still hanging out at Cafe du Monde, a favorite spot for French roast coffee and beignets, and a man playing a trombone outside had a box full of tips. "They said get out, but I can't change my flight, so I figure I might as well enjoy myself," said George Senton, of Newark, N.J., who listened to the music. "At least I'll have had some good coffee and some good music before it gets me." Tourist Dee Barkhart, a court reporter from Baltimore, was drinking Hurricane punches at Pat O'Brien's bar. But Barkhart's drinks would have to be for the road. The bar planned to close by nightfall. Elsewhere along the Gulf Coast, thousands of residents, gamblers and tourists crowded northbound roads. Motels were booked as far north as Jackson, Miss., and Montgomery, Ala.
Mississippi regulators ordered a dozen casinos along the state's 75-mile-long coast to close at noon Tuesday. Many gamblers pumped coins into the slot machines right up to closing. "I don't worry about what's going to happen tomorrow. We can't control it anyway," said Ed Bak of Fairfield, Ohio, who dropped quarters into a machine at the President Casino. Northrop Grumman Ship Systems, a major shipbuilder for the Navy, closed its Pascagoula shipyard, which employs 12,000. In Alabama, Gov. Bob Riley ordered the evacuation of coastal resorts. "This is a serious storm that requires serious action to get people out of harm's way," he said. In Gulf Shores, Ala., the heart of the "Redneck Riviera," the sugary white beaches and offbeat tourist spots were largely deserted. Workers at Souvenir City, where tourists enter by walking through the mouth of a huge shark, packed up glass figurines for storage in a warehouse. "I don't know if it will be any safer where they're taking it. Only the good Lord knows what's going to happen," said Pamela Davis, an employee. Along Florida's Panhandle, the sounds of saws and drills filled the air as people put up boards to protect their homes and businesses. "We are just hoping to still be here," said Matt Claxton, an assistant manager of a Perdido Key seafood restaurant as workers brought the patio furniture inside.